Rye’s water supply system dates from the 16th century and includes a surviving brick cistern and tower, standing in the north east corner of St Mary’s churchyard. The cistern predates more well known Victorian water systems by more than 100 years, and is now a Grade II* listed building and a Scheduled Ancient Monument. Rye has been an important commercial borough since the 11th century, when it was a trading port on an embayment of the English Channel. Over time, Rye's safe harbour was lost through longshore drift, storms and siltation and the town now lies some 2.5km inland. Rye is one of two 'Ancient' Towns (the other is Winchelsea) that forms part of the confederation of historic south coast towns known as the ‘Cinque Ports’ (Hastings, New Romney, Hythe, Dover and Sandwich). Rye’s mercantile significance brought prosperity, and there was increasing civic expenditure during the 16th century to provide infrastructure for a growing population. Water was derived originally from three sources — the cliffs in the north that are part of the Ashdown Sands formation, Dodeswell (also called Brickwell or Queen’s Well, TQ920209) on Deadmans Lane and several springs on Leasam Hill in the north west of the town. It is recorded that a water cistern was built in 1520 (location unknown, possibly Strand), followed in 1548 by another cistern in St Mary’s churchyard. They were part of a water supply system that had begun to replace the collection of water by hand. In 1597, Thomas Lashinden of Sedlescombe was granted the right to "lay a quill [small water pipe] of lead or other material from the main waterpipe, between Budgwell and the postern on the north side of Rye, to his tenement called Woode house”. Budgwell, or Budge-Well, was a cistern built to collect water from the Ashdown Sands springs. Its name comes from the wheeled water barrels, or ‘budges’ used to transport water. In 1628-9, lead pipes were laid to convey water from the various sources to cisterns in the town and a “water-house at the bottom of Conduit Hill". The pipework received regular attention. In May 1634, William Burwash and John Wrenn entered into an 11-year contract with the Mayor and Jurats (municipal officers similar to aldermen) of Rye to repair and maintain the spring heads and pipes. Seven-year repair contracts were let to Thomas Ren (in 1648) and William Malpas (1650). In 1658, John Peadle was given an 11-year contract to "maintain all lead pipes from the spring heads beyond Budgwell, at Leasam to the New and Strand Conduits and the Budgwell near Mountstyle, and either to mend with solder or relay new pipes". It's now not clear where Mountstyle was located. In March 1684 and December 1701, taxes were levied for further repairs to the pipes and conduits. Presumably as a result of the extra funds, in December 1709, plumbers Joseph and Thomas Griffen "cast and laid leaden water pipes from the New Conduit to the New Fountain Head" and contracted to maintain them for 20 years. In 1713, the Griffens entered into a similar agreement with the corporation for pipes from Brickwell fountain head to the Strand conduit. In 1718 the water-house was rebuilt and a pump driven by a horse gin installed to pipe water from the Ashdown sands springs. In 1727, Rye Corporation appointed a committee for water supply. In 1728, the committee estimated that the cost of piped water for the town's streets would be £600. In 1730, the corporation bought 4.9 hectares of St Mary's Marshes from Henry Montague for £610 as part of the scheme. In 1733, the 19mm bore lead pipes laid originally were removed because they were "too small to convey the water from the new conduit to the Strand" and replaced by 51mm bore elm pipes. Elm pipes also carried water to the highest point in the town in St Mary's churchyard, 24.4m above the source, where a red brick cistern and tower were built between October 1733 and 1735. The cistern is oval in plan, measuring 9.1m by 6.1m, with a dished floor 915mm below ground level and an elliptical arched roof. It contains 90,920 litres of water at a maximum depth of 2.4m. The oval brick tower, some 5.2m by 2.7m overall, is founded on the floor of the cistern and supports the roof arch, rising above it by 3m. The tower is capped by a curved tiled roof with a central dressed lead ridge and a wooden pinnacle. The east and west sides of the tower have timber doors. The cistern and tower are sited on the north-east side of Church Square (formerly Pump Street). At the time, Market Street was a butchery area and, in 1754, it was reported that calves' feet had been found in the reservoir, poisoning the water. Thereafter it was stated that anyone who deposited "dirt, dust, soil, trash, nastiness or anything else" in the cistern would be liable to prosecution. A lead pump with lead or cast iron pipework was added to the system in 1826, and water was pumped up Conduit Hill from the water-house to the cistern. A maintenance contract of 1828 shows that the pumping engine ensured that a 1.8m depth of water was maintained in the churchyard cistern, with any excess water diverted into the Strand cistern. In about 1846, the mains water supply was extended from the churchyard cistern through High, Lion, Market, East, Middle, Mermaid, Watchbell, Church, Landgate and Tower Streets. The present water-house (TQ921205) on Tower Street is dated 1869, marking when the steam engine and pump were installed. 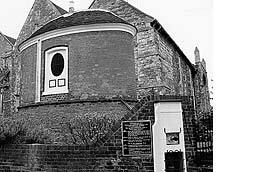 Though now disused, it had subsequent uses as the town’s soup kitchen (1907) and later its public lavatories. It is now a shop selling antiques and curios. In 1892-4, new waterworks were constructed in Playden, north of Rye, and the Tower Street water-house became obsolete. A 227,300 litres capacity reservoir was built in Military Road to store water from the Budgwell springs. A steam engine pumped water at a rate of 18,184 litres per hour up to a covered reservoir (TQ922212) of 340,950 litres capacity on Point Hill, to provide a gravity supply to the town. By 1898, increasing demand for water led to a new pumping station and borehole being constructed at the base of Cadborough Cliff, west of Rye.